Next Meeting. Our next meeting will be a meet-and-greet event with City Council candidates, on Thursday, September 20 at the Commonwealth Baptist Church. More details will be circulated in August. We also intend to schedule a forum for School Board candidates; again, details to follow. Braddock-King-Callahan Intersection. The City has posted its plan for improvements to the King Street-Callahan Drive-Russell Road intersection (https://www.alexandriava.gov/localmotion/info/default.aspx?id=77933), which have been under development for several years. These improvements – to be funded with federal money – are designed to emphasize pedestrian and bike safety/access, but also are incidentally expected to reduce rush-hour backups. We are working to schedule an on-site presentation about the plans by the City, on Tuesday, August 21 – more details will be circulated once it is confirmed. Fourth of July. The RCA resumed its tradition of holding a Fourth of July celebration at Maury Elementary; many thanks to all those who attended, organized, and supported the event. Photos have been posted to our Facebook page (see. 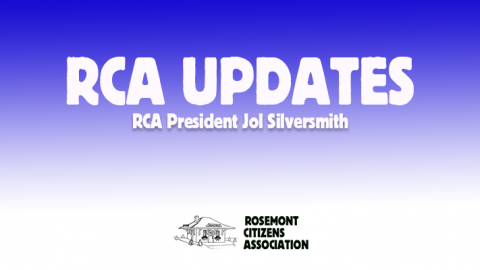 e.g., https://www.facebook.com/RosemontCitizensAssociation/posts/10157534316488496). Metro Disruptions. Track work in August (the 11th through the 26th) will have an impact if you commute downtown – single-tracking between McPherson Square and Smithsonian, reduced frequency on the Orange/Silver Lines, and the suspension of all Blue Line service beyond Arlington Cemetery. Further work with direct impacts in our area is scheduled in November. See https://www.wmata.com/service/track-work.cfm for more information. Additionally, construction at the King Street Metro to rebuild and redesign the parking lot begins in September, with preparatory work starting in August; see the attached flyer for details. Keeping Informed. 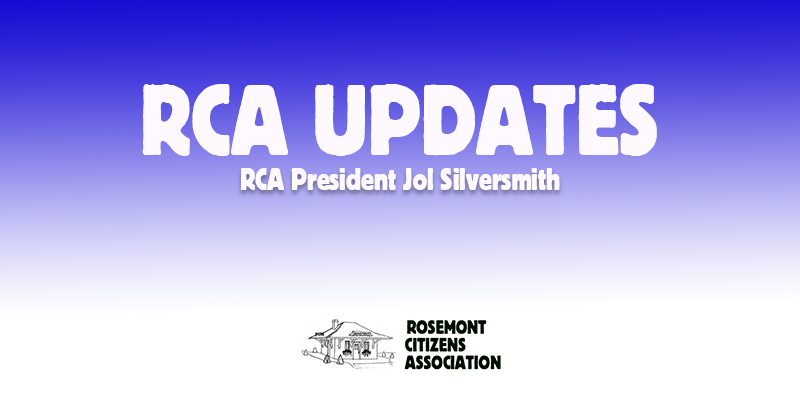 We try to provide regular updates on local news, Rosemont history, and general happenings in Alexandria via our Facebook page (https://www.facebook.com/RosemontCitizensAssociation/), cross-posted to Twitter (https://twitter.com/RosemontCitizen) and our web page (http://rosemontcitizensassoc.org/facebook/). Please consider following one or another (as well as the independent Rosemont email list, https://groups.yahoo.com/neo/groups/rosemontva/info, and the community forums at https://nextdoor.com).